Primarily selling flowers, Canaflora uses an innovative business model to send these little (or big) bouquets of happiness. Considered a top brand across the country, we are the website to go to and the number to dial if you need to send a gift across the country or down the street. 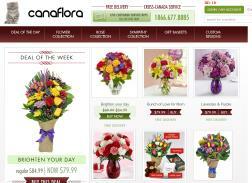 Canaflora : Save 15% on your order. Plus, get free delivery.